News on inflation, home loan rates, fuel economy tips and medical billing mistakes..
Geopolitics, Flight-to-safety and Important Housing News - How geopolitical events with Russia, Ukraine and the Middle East impact home loan rates—plus, key housing reports. What to Watch: Is Inflation on the Rise? - Inflation is the archenemy of home loan rates. Find out if it's on the rise, and what this could mean. 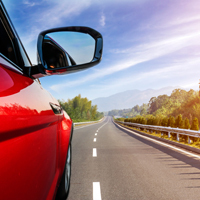 Hot Weather Fuel Economy - Your car's air conditioning doesn't have to be a drain on your wallet at the pump—check out these great tips. Q&A: Are You Paying for Free Healthcare? - Make sure you know what services are covered under the Affordable Care Act. If you have any questions or would like to discuss your unique situation, call or email today. And please forward this newsletter to friends, family members and coworkers who may find the information helpful. Geopolitical headlines have had a dramatic impact on the markets this summer. The U.S. Treasury Department and the European Union imposed further sanctions on Russian business, while a Malaysian jet was shot down over the Ukraine. And further unrest in the Middle East has left markets jittery. When news reports such as these are released, they generally cause a flight-to-safety into the U.S. Bond market. "Flight-to-safety" is defined by investors moving their capital away from riskier investments (like Stocks) to the safest possible vehicles (like U.S. Treasury Securities and Bonds), usually triggered by uncertainty in the financial or international markets. If the news from overseas continues to be negative or uncertain, this could provide a boon to the Bond markets. And since home loan rates are tied to Mortgage Bonds, if Bonds improve, home loan rates would improve as well. In housing news here at home, Housing Starts remained gloomy in June, as they declined by 9.3 percent from May to an annual rate of 893,000, well below expectations. 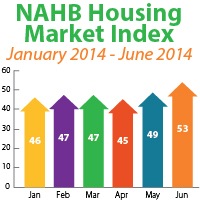 This was the slowest pace in nine months, led by a drop in single-family homes and apartments. Building Permits, a sign of future construction, also fell below expectations. And according to reports from research firm CoreLogic, home price appreciation is also cooling off to more normal levels when compared to the high figures seen last year. There was some good news for housing, as the National Association of Home Builders Housing Market Index reported its first optimistic reading this year of 53. Readings above 50 indicate that builders see conditions as good, making this a long awaited improvement! While the housing sector has shown signs of recovery overall, activity has leveled off and some readings this year continue to be disappointing. The good news is that home loan rates remain attractive compared to historical levels, and now is a great time to consider a home purchase or refinance. As always, please let me know if you have any questions! What to Watch: Is Inflation on the Rise? Inflation at both the wholesale and consumer levels can have a big impact on the markets and home loan rates. Here's what you need to know. What is the Producer Price Index? The Producer Price Index (PPI) measures inflation at the wholesale level by measuring the average change in selling prices received by domestic producers of goods and services over time. PPI measures price changes from the perspective of the seller. 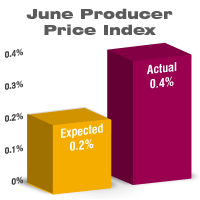 PPI for June showed inflation at the wholesale level was hotter than expected, rising 0.4 percent due to a rise in energy costs. That being said, the June Consumer Price Index (CPI) was in line with expectations and lower than the percentage recorded in May. It will be important to see if higher inflation at the wholesale level begins to impact prices at the consumer level.What does this mean for home loan rates? Inflation is often called the archenemy of Bonds, because it reduces the value of fixed investments. And, as noted above, since home loan rates are tied to Mortgage Bonds, if inflation continues to rise, it could have a negative impact on both Bonds and home loan rates.However, continued tensions in the Ukraine and the Middle East could keep investors in the safe haven of the Bond markets, offsetting the impact of inflation and helping Bonds and home loan rates in the process. All of these factors will be important to watch in the weeks and months ahead. I'll continue to monitor geopolitical events and all other major economic reports to keep you posted on their impact on the markets and home loan rates. But if you have any immediate questions, please call or email today. Before you start driving, don't idle with the air conditioning (AC) running. Turn on the AC only after you begin to drive and after airing out the cabin briefly with the windows rolled down. Roll your windows down at low speeds, and only use AC at highway speeds. Don't use the AC more often than needed, and don't set the temperature lower than you need. Park in the shade or use a sunshade so the cabin doesn't get as hot. Always read your owner's manual! Most manuals explain how the AC system works, and how to use and maintain it efficiently. For plug-in hybrids and electric vehicles, pre-cool the cabin while plugged into the charger. For even more tips on fuel economy, visit the U.S. Department of energy's website fueleconomy.gov. Q&A: Are You Paying for Free Healthcare? Question: Do you know what services are supposed to be free under the Affordable Care Act? Answer: Under the Affordable Care Act, services related to preventative care—including annual physicals, colonoscopies, flu shots, mammograms and many vaccinations—should be covered by your insurer, even in plans with higher deductibles. Views You Can Use: News on inflation, home loan rates, fuel economy tips and medical billing mistakes.